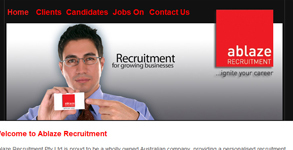 Ablaze Recruitment is a boutique IT recruitment agency based in Sydney, Australia. They required a small, bright, website that allowed them to post jobs online. Creative Development created the website and then used Google Adwords to promote their services. Since then Ablaze has upgraded their website to a wordpress website that uses the posting function as a Job board. WordPress has allowed them to have a full SEO compliant website they can update whenever they want at a low operational cost. We product recruitment web design that will grow your business.